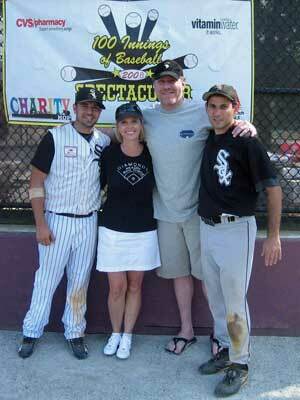 This Labor Day weekend, players from the Boston Men’s Baseball League, Park, Yawkey, Cranberry, MIBL, BABL and several other local leagues successfully completed the 5th Annual 100 Innings of Baseball Spectacular to raise funds for Curt’s Pitch for ALS, the charity of legend Curt Schilling of the Boston Red Sox. The big hitter appears to be Neil Sisson of the Medford Angels, one of 11 athletes to play all 100 innings. Sisson led all 100 Inning batters by going 18 for 34 at a .529 clip. Dave Joseph of the Brockton A’s was the hero on the mound, tossing more than 35 of the 100 innings!